Der Call for Papers und Call for Films für die Konferenz vom 23.-24. Mai 2019 in Berlin ist veröffentlicht. 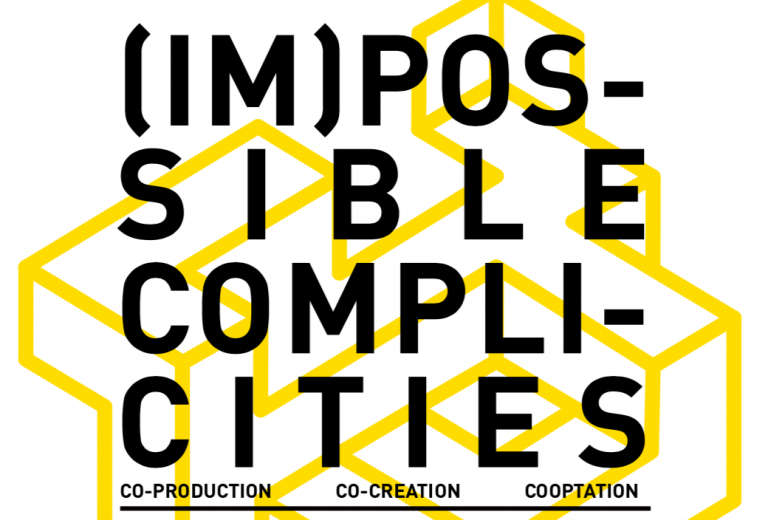 "(Im)possible Complicities" will eine Plattform für Ideen aus der kreativen Praxis und dem Engagement in sozial benachteiligten Milieus bieten. Wir möchten mit AktivistInnen, KünstlerInnen und AkademikerInnen konstruktiv und kritisch über die Potentiale und Risiken von co-kreativer Projektarbeit diskutieren. Die Konferenz ist Teil des CoCreation - EU Marie Curie Rise Projekts, das in Zusammenarbeit mit akademischen und nicht-akademischen PartnerInnen aus Europa und Lateinamerika entstanden ist. Die Konferenz verfolgt einen praxisorienterten und multidisziplinären Ansatz und will Raum für innovative Präsentationsformate bieten. Film submissions should be sent in the same format including a link and password to access the film. Participatory approaches in local policy are evergreen prescriptions, undisputed receipts for any intervention aimed at spatial development, social cohesion and cultural empowerment. Creativity is the natural seasoning of initiatives aimed at social and spatial development in distressed territories. Artists and designers seek the complicity of citizens and local communities to legitimate their production. In return, their language and skills may empower communication and organisation capacity of local communities. They can support reflexive capacity and give voice to local struggles, or engender in the most successful cases solidarity. There is a rich body of literature addressing innovation at the micro-level, but the local scale alone cannot be where all problems are created, understood and solved. While the localist discourse is often used to veil receding public support and let local communities compete alone for survival and resilience, creativity that fosters social innovation finds itself distorted into palliatives, if not mere cosmetic practices. The purpose to produce benefits for local communities and dispossessed subjects may easily turn into producing visibility for the creative players themselves. Artists and social workers who mediate co-productive processes end up, consciously or not, serving vested interests. Green-washing, art-washing and gentrification are some of the words employed to spell out the cooptation of creative forces by dominant players and economic forces. ↘ The meaning of co-creation, co-production, co-optation. ↘ Co-creation and community engagement for what and for whom. ↘ The role of art in addressing political agency at different scales. ↘ The issues of ownership/authorship in co-creation processes. ↘ Time and engagement, the limits and advantages of short-terms vs long-terms. The conference is part of the CoCreation- EU Marie Curie Rise ( www.tesserae.eu/project/co-creation) project involving academic and non-academic partners from Europe and Latin America. The conference will have a practice-oriented multidisciplinary approach. We encourage non strictly academic formats and interactive presentations. One session will be dedicated to film screening or presentations based on audio-visual works (max 20 min. ).